Thursday evenings are for family dinner time, and this Thursday we decided to dine at Verdura, a new Mediterranean restaurant that was opened four months ago. As it was our first time at Verdura, we didn’t know what to except, but nevertheless we were looking forward to our dining experience. 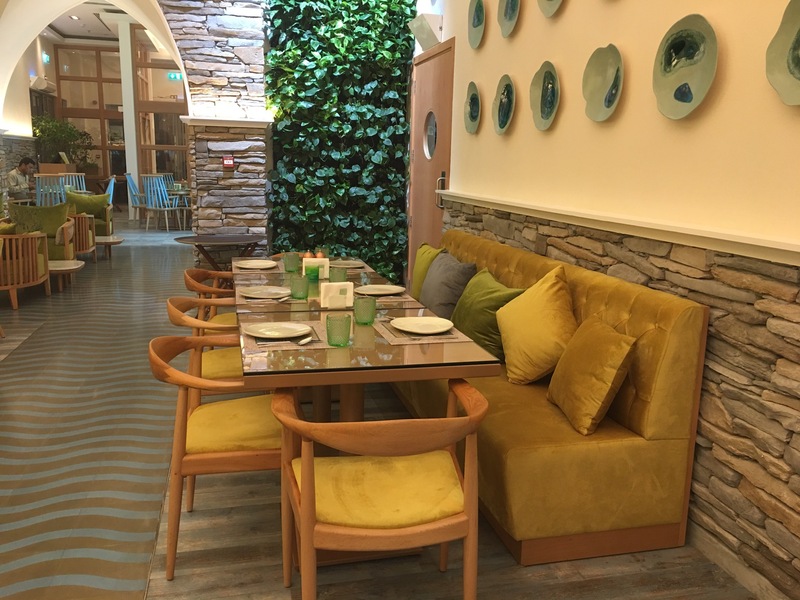 Located in the Persia Court, near New Metro Link in Ibn Battuta Mall, Verdura is a casual fine dining restaurant offering Mediterranean cuisine. You can expect flavors from countries like Greece, Italy, Lebanon and Syria. Verdura restaurant is the vision of Global Catering Services Group. The restaurant is open early in the morning till late in the night and it offers breakfast, lunch and dinner. The menu is vast and diverse. Verdura is fronted by talented and creative Chef Ahmad Al Fakier. He has brought a modern twist to the classic Mediterranean cuisine. Inspired by the unique Mediterranean nature of sun, sea, soil, structures and greens, the Verdura restaurant’s architecture is a true reflection of the brand’s essence “naturally natural” that reconnects guests with the elements of nature. A comforting space where customers feel nestled within Mediterranean type trees and other greens of which in part are planted and grown at Verdura’s premise. Embracing how Mother Earth grows things, at Verdura everything looks handmade and imperfect. This fact makes perfect sense to our guests as a testimony to the brand’s promise of being “naturally natural”. Verdura is not like a typical mall restaurant, it has a vibe of a tranquil oasis. The Mediterranean inspired decor of the restaurant looks stunning. Loved the rustic and earthy appeal of the restaurant. The spacious restaurant offers indoor and outdoor dining area. There is a separate smoking area too. This tastefully done restaurant has plants placed in every nook and corner. We liked everything about the place from the decor, to the tableware and the menu. And we couldn’t wait to try their food. We started off with the drinks first. Verdura’s drinks menu is vast and we were spoilt for choice. We ordered 4 kinds of Mocktails– Apple Spiced Mojito, Blueberry Ginger Mojito, Green Fresca and Blackberry Pepper Iced Tea. Each of our drinks were deliciously different, fresh and utterly tasty. They were also served in a very innovative manner. Verdura’s menu offers soups, salads, baked breads from the oven, cold appetizers, hot appetizers, mains, grills and desserts. We were offered complimentary fresh Bread and Labneh in the beginning. Then our appetizers arrived one by one. Kale Salad with Arabic Dates and Bulgarian Cheese had a great taste and flavor. Homemade Shanklish with watermelon and tomatoes was so different from the Shanklish I’ve eaten in other restaurants. According to me, Verdura makes the best Shanklish in Dubai. Burrata Cheese with Zaatar Pesto, Aubergine and Dukkah Spices was another outstanding dish. We loved the way it was presented. Quinoa Salad with Pumpkin Seeds, Vegetables and Dukkah Spices was a wholesome salad that was fresh and delectable. Vine Leaves with Olive Oil was made with tender vine leaves and stuffed with rice and herbs. It tasted like little bites of heaven. Three Cheese Mankousha is a simple and flat Arabic bread. It was loaded with three varieties of cheese and was served fresh out of the oven. Margherita Pizza had a homemade flavor and freshness. It had thin crust and tasted oh-so-good. Grilled Vegetables with Butter and Spices was grilled to perfection. As my family and I are vegetarians, we didn’t try their meat and seafood specialties. But my friend did and gave a big thumbs up to all the non vegetarian dishes that she tried. Some of the dishes that she liked were Mini Trio Kebbeh, Crispy Shrimp with sumac and chilli Mayo, Verdura Special Lamb Chops and Whole Grilled Sea Bass served with tahini and grilled veggies. Dessert was a decadent affair, first we tried their Kunafa Roll that was stuffed with orange pastry cream and topped with Ghazl El Banat or cotton candy. It was so refreshingly different and light compared to the traditional Cheese Kunafa. Heavenly tasting Kunafa Roll is a must-try at Verdura. Dates Cake with caramel sauce and Tempura dates was the second dessert that we ordered. The cake was moist and absolutely delicious. We liked this dessert too. 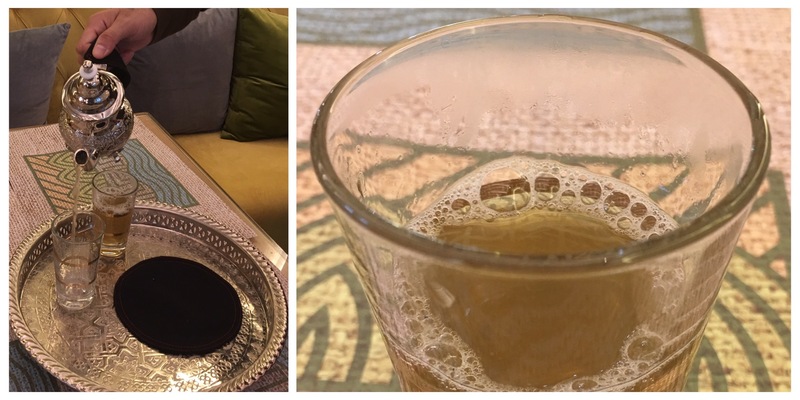 We ended our dinner with the aromatic and soothing Moroccan Tea. What a wonderful dining experience it was! Verdura really exceeded my expectation. The food, the drinks, the service, the staff and the ambience was amazing. We can’t wait to visit them again.